Mondays and Fridays are my work-in-the-office days, so I step away from the farm and drive a few miles and spend a good part of the day wondering about the farm. Yesterday it was pouring most of the day. 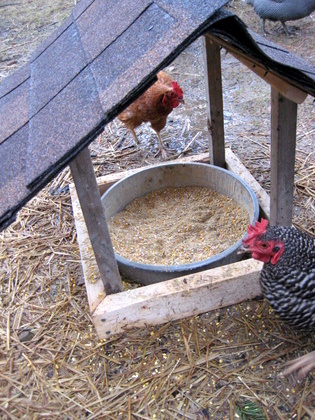 “We really should do something with the chickens’ feed bowl when it rains, besides just put it in their coop or their condo,” I thought. Luckily, my husband was thinking the same thing. I came home to find the girls pecking out of this. Add farm junk and presto: instant feed station! Fantastic! I need to make one for my birds! Thanks for sharing this. El, where did you get that dish? I just bought a big huge 30 lb. feeder for my girls as I was tired of refilling the 10 lb. one all the time (when it gets low the gravity feed stops working). But I can already see that that maybe wasn’t the best idea as now they’re putting feed everywhere and it’s going to get wasted. Using a dish like that screwed to a wood platform in their shack might work better. Robin: Hah, you’re welcome! Don’t you think “farm junque” makes rather interesting repurposed things? Laura, well, probably the same place you got your snazzy boots: at the farm store. (BTW I have the same pair in a much more boring color. They’re great.) It’s just a galvanized pan used for feeding bigger farm animals. I had tired of the same thing so we just got a bigger tub. You might not want to bolt it down though as that’d make it a mess to clean. Anyway, we have the gravity feeder too in the coop. This one is just easier to schlep around. Love it! We have plans for something similar, since the birds’ food (and the birds) end up soggy and muddy from the rain. This inspires me to use the saved roof (3X5 size) from the old rabbit hutch for a hang out spot for the ladies… I could put the back rim against the goat cabin and use 4×4’s for the legs under it… That way if any future baby goats use it as a mountain, it will serve double purpose! Tammie: I think it’s great to get second uses out of things, and here you are considering a third! Yay.